The world is demanding innovation in every sector — in business, in engineering, in education. Students need to be prepared to meet those demands as they enter the workforce and become engaged citizens. 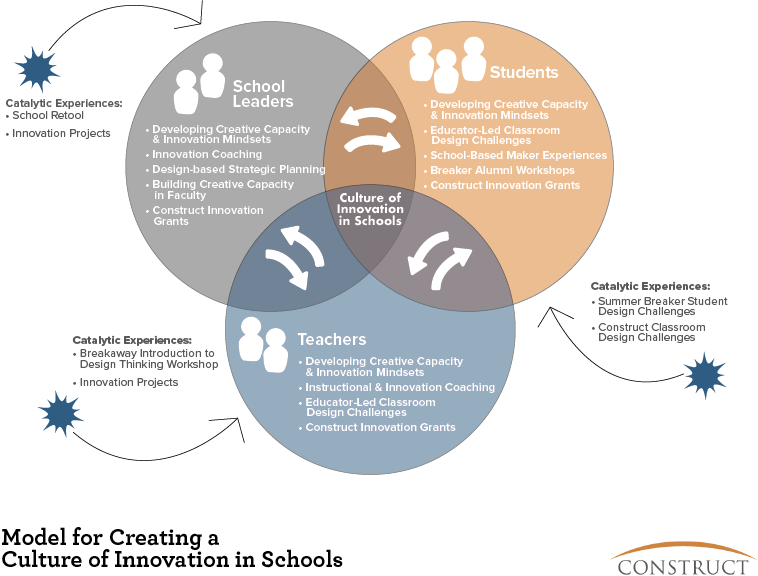 Cultures of innovation take hold when students, teachers, and school leaders have tapped their capacity for creativity. When a culture of innovation takes hold at a school, school leaders and teachers will feel energized and students will get what they need to succeed in the future. Construct is working across Oregon, using the powerful tools and methods of design to activate networks of students, teacher leaders, principals, and assistant principals who are ready to re-imagine and re-design the school experience so that every student is prepared to succeed. We engage industry and community partners in this process linking employers with educators to add relevancy to the learning experience. Schools already have what they need to drive innovation in the way their students experience school, they just need support to accelerate the process. The tools and methods of design can help school leaders, educators, and student tap and grow their creative capacity. 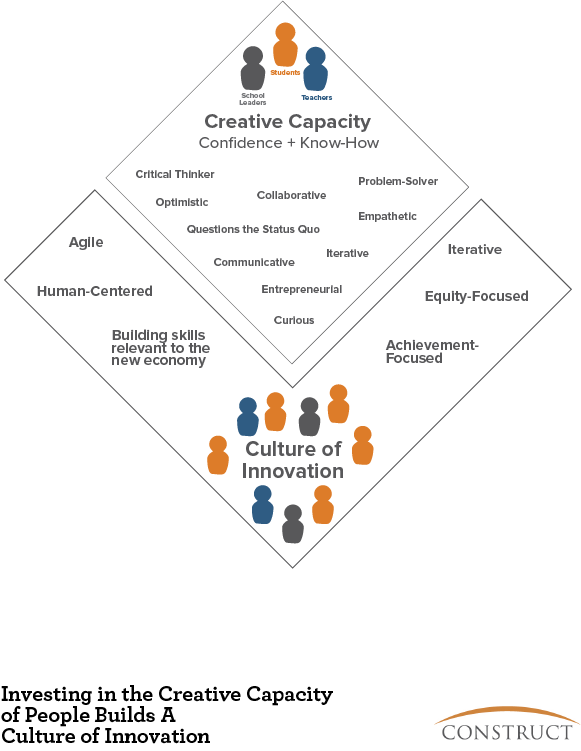 WHAT DOES CREATIVE CAPACITY LOOK LIKE? We build the creative capacity of students, teachers, and school leaders in order to create cultures of innovation in schools. This change can be transformational for both individuals and for the system. Cultivating creative capacity in students, teachers, and school leaders does not happen overnight. It requires cycles of learning where participants are guided by an expert toward their own mastery of the methods and mindsets of design. 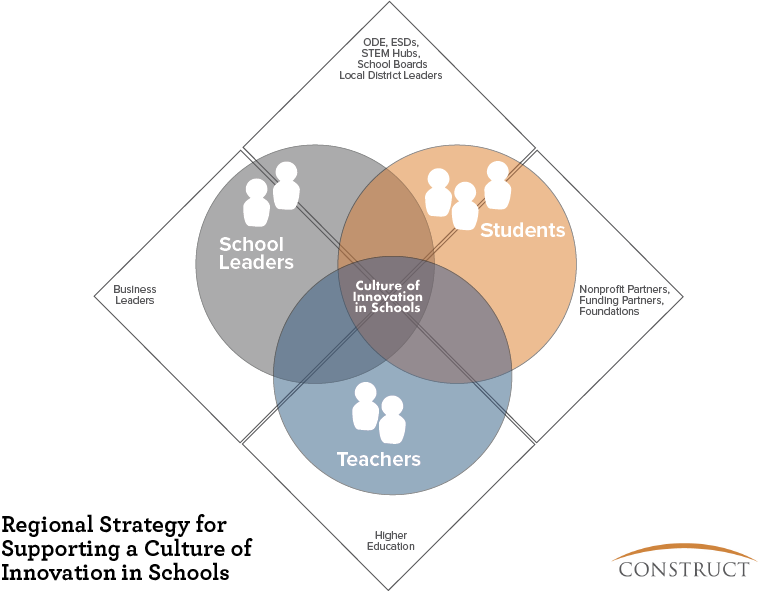 At Construct, we know that school leaders and educators have a lot on their plate. That’s why we offer introductory catalytic experiences that are a low time commitment but give participants exposure to the power of the design process. 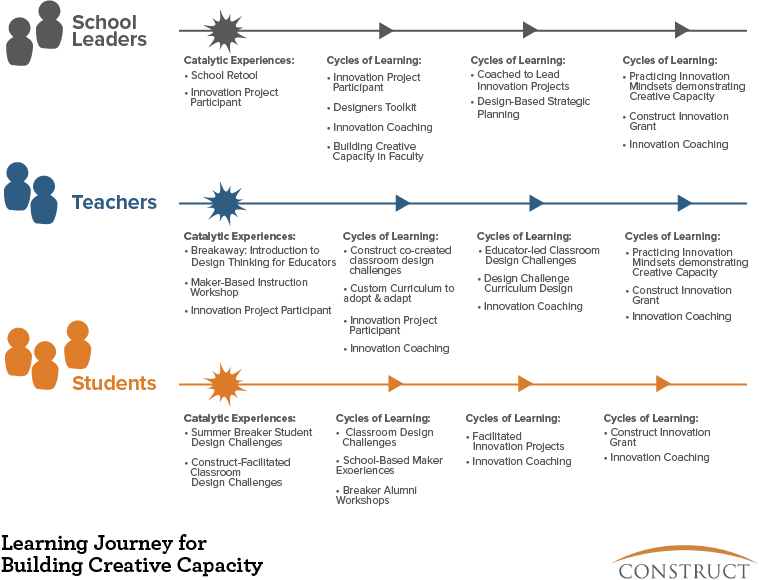 From there, we seek school and district partners who are excited to go deeper and develop the creative capacity in their school leaders, teachers, and students in order create a larger culture of innovation at the school. We believe that creating and supporting a culture of innovation in schools cannot be the work of school leaders and teachers alone. Construct brings together strategic partners from across sectors, including education policymakers, business leaders, higher education leaders, non-profit partners, and funders to support local schools to create these cultures of innovation through expertise, resource sharing and funding. At Construct, we draw from research-based best practices of business, design and education to drive forward our work building cultures of innovation in schools. We believe in the power of cross-sector collaboration to drive innovation. We also believe that schools should have the best tools from every sector available to them. We love introducing students, educators and school leaders to tools not commonly used in schools in order to cultivate their creative capacity.